These are some of my flowers in past years at my parents’ house. I considered it my contribution to the household to plant and take care of the flowers. 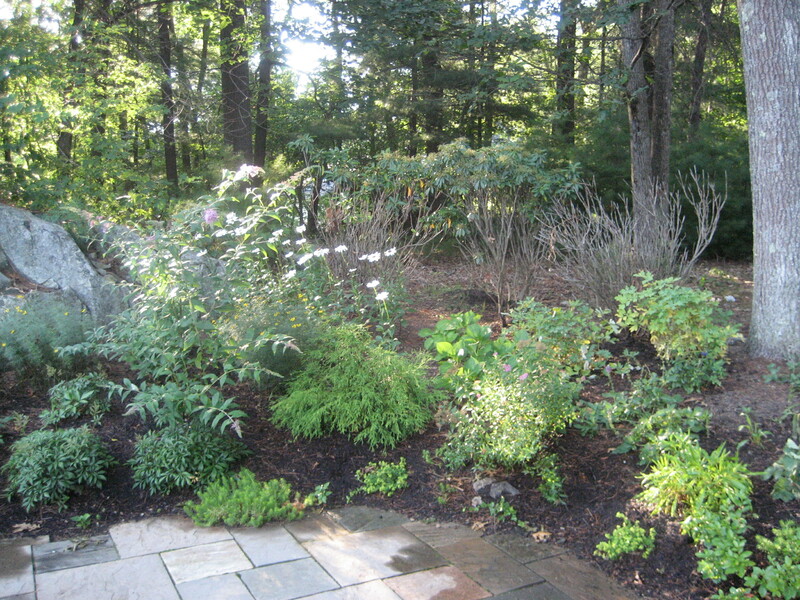 I got really into gardening when I was in college and decided I needed a perennial flower garden a few years back. 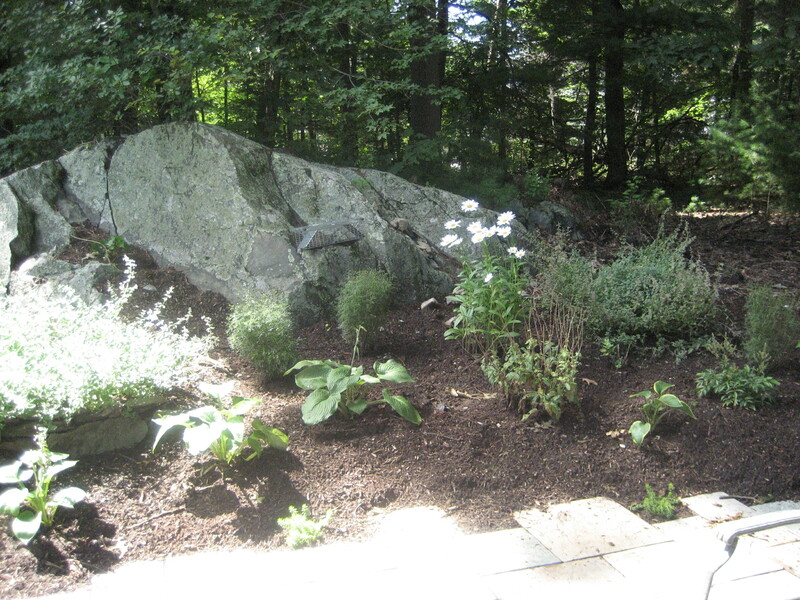 I dug out a bunch of the rocks in the soil around the edge of my parents’ yard (New England has very rocky soil). My dad and my sister helped. 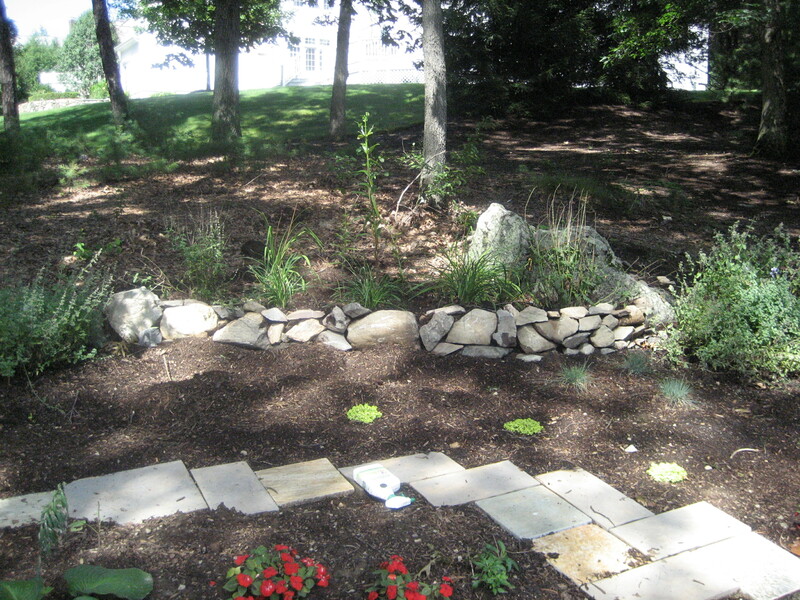 I then used the rocks to build a low rock wall (pictured below), which I then backfilled with better dirt for my flower bed. My sister helped with this as well. It was the last time she participated in any gardening activities. 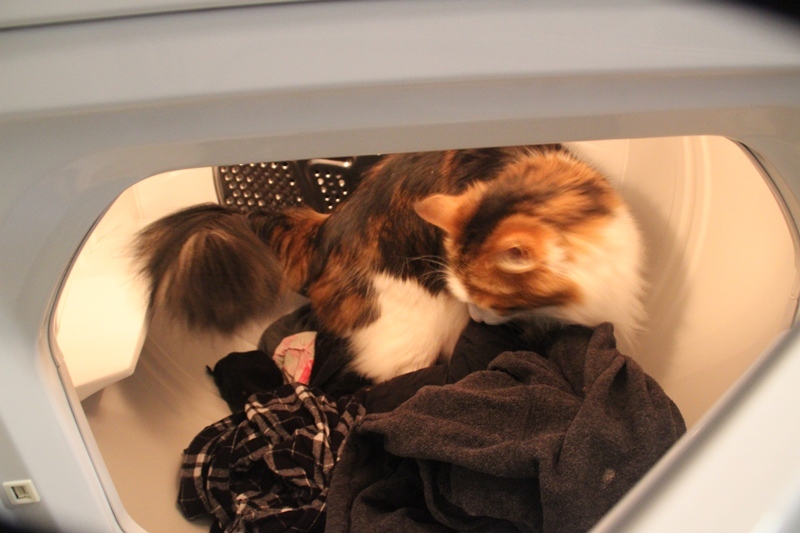 She discovered that she does not like manual labor involving dirt and rocks. 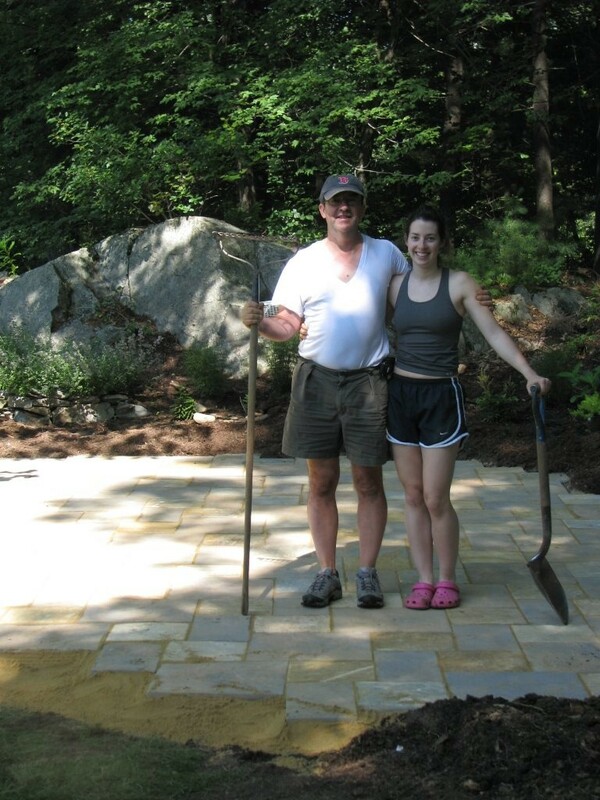 A year after I built the rock wall, I convinced my dad to help me put in a patio. He did a lot of the heavy duty prep work, like using his John Deere to level the dirt and remove large rocks and dead tree roots. 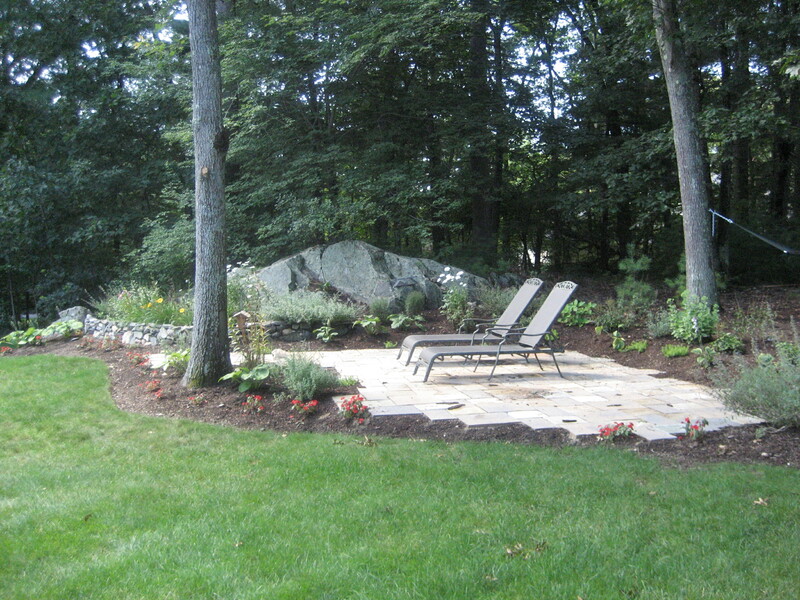 I helped with spreading and leveling the sand and then I laid the stone pavers. Thank you for helping me/doing the hard part, daddy! And then the John Deere and I got to work planting new plants and transplanting plants from other places in the yard. 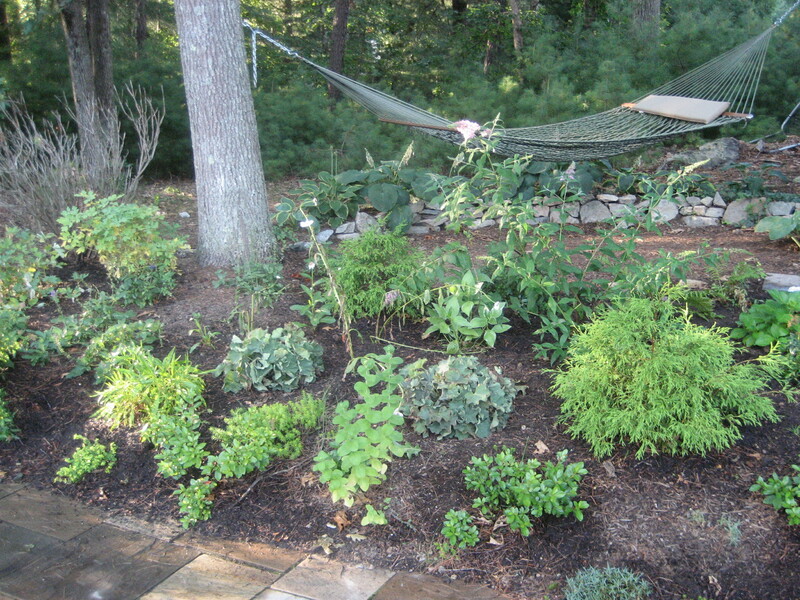 I did some transplanting from the front yard…. 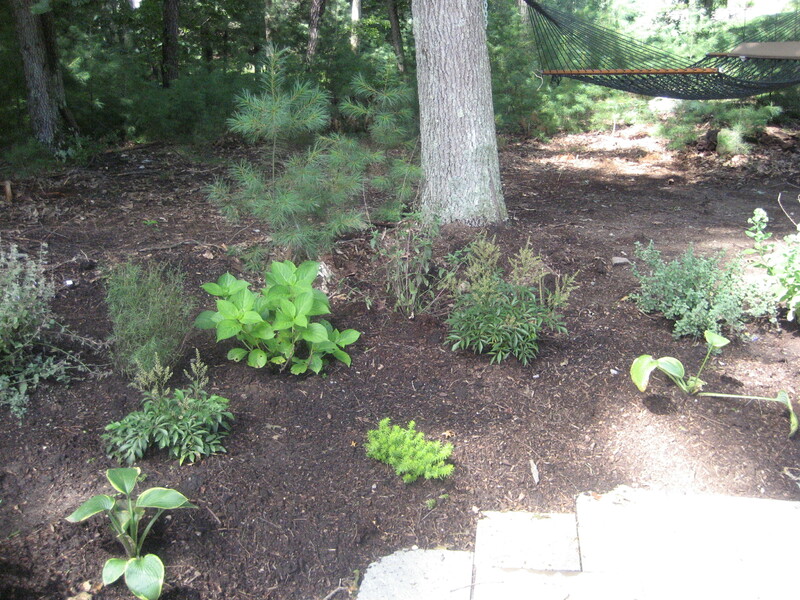 …and then I bought some new plants and planted them. 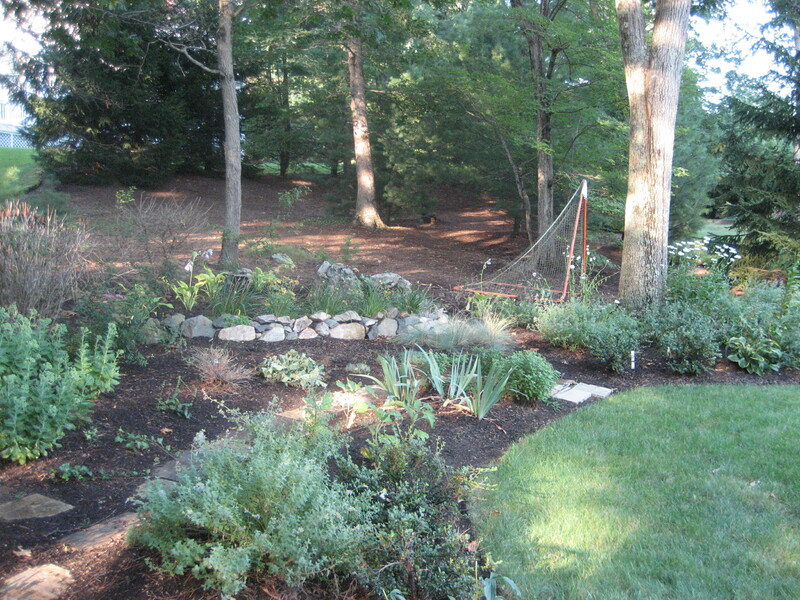 And then I did some more planting and there was still a lot of empty space, but the plants needed room to grow and I would fill in new plants over time. Apparently, I wore very strange attire one day when I did some planting. I don’t know what to say about this ensemble except that it was very hot outside and I was trying to keep my feet (but evidently not the other 90% of my body) free of dirt. 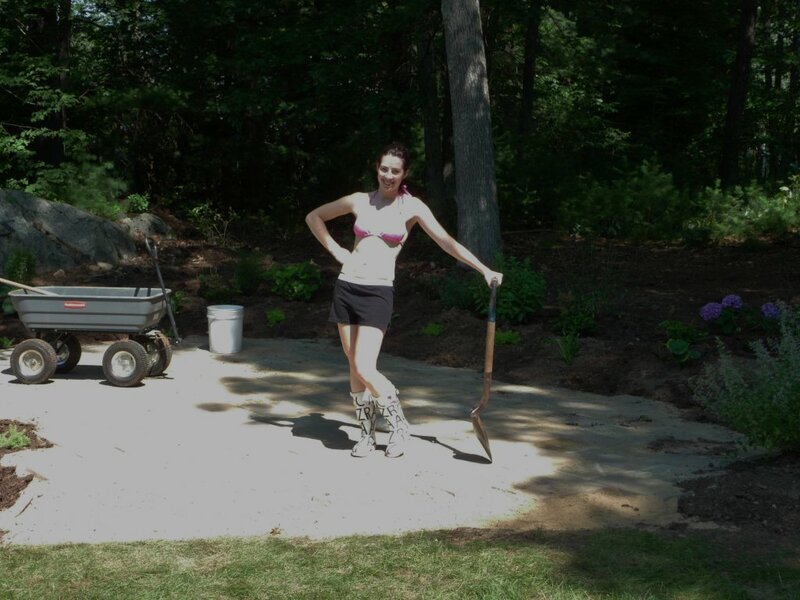 I must have been delirious from heat exhaustion at this point to strike such a pose, in such an outfit, in such a setting…with a shovel and without a tan. 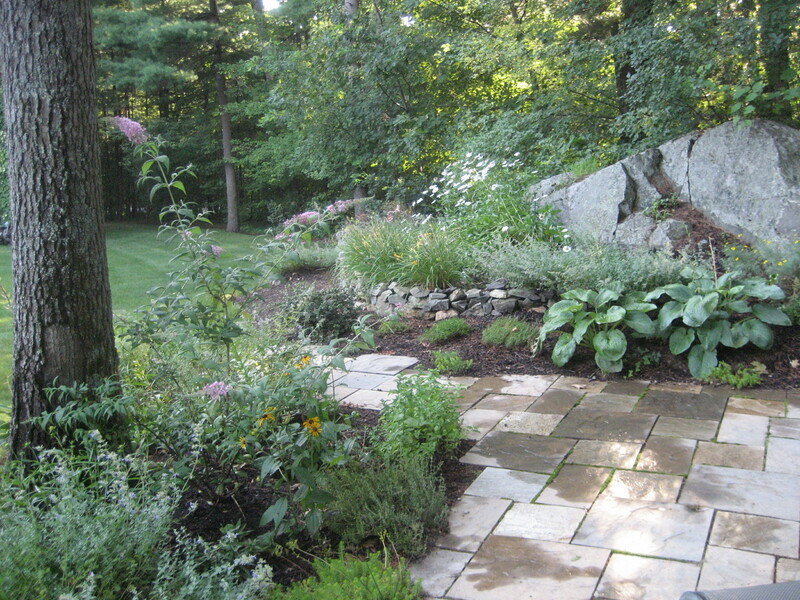 This is what my garden looked like last summer, the third summer of the perennial garden/patio’s existence. 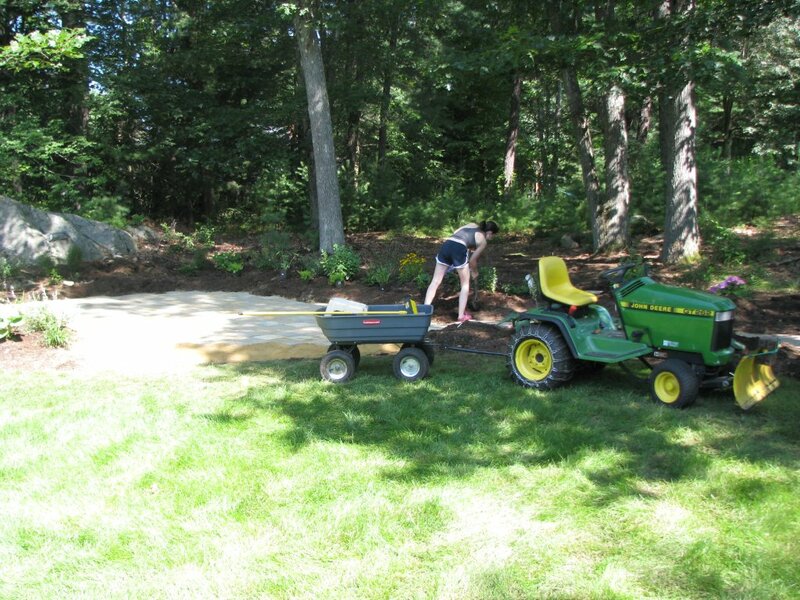 Two years ago, my dad and I transferred 4 cubic yards of good dirt one lawn tractor load at a time from the driveway, where the truck dumped it, to my garden at the edge of the yard. This definitely improved the growing conditions for my plants. It also improved my appreciation for every poor soul in the landscaping business. But my plants were happy. I’ve always loved to play in the dirt and I’ve spent every birthday for the last 5 years planting something in my parents’ yard. This year for my birthday, perhaps I will plant something at my grandparents’ house or maybe I’ll see if the landscaping crew at my apartment complex will let me volunteer for a day. I’m not sure how well that will go over, but it’s worth a shot. 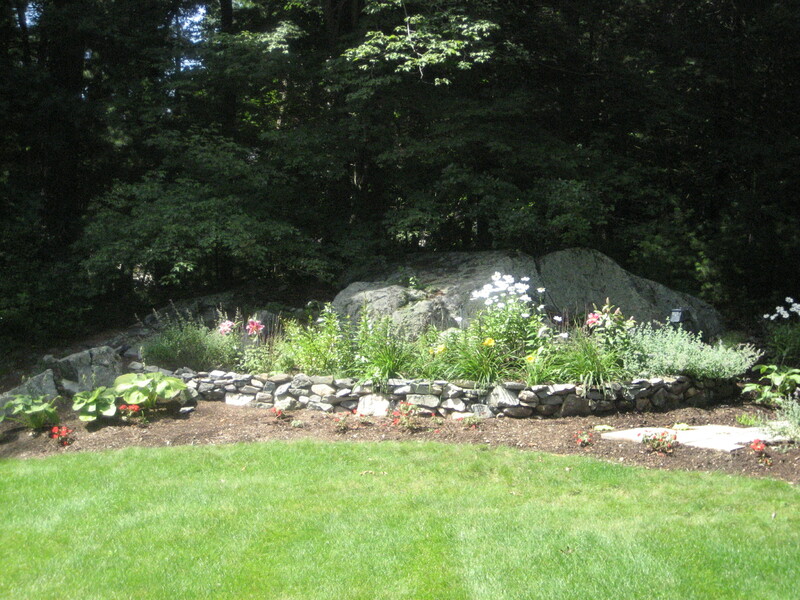 I added this rock wall (behind the hammock) 2 years ago from even more rocks that we uncovered when mending the soil. I was constantly moving things around, into the sun or into the shade. 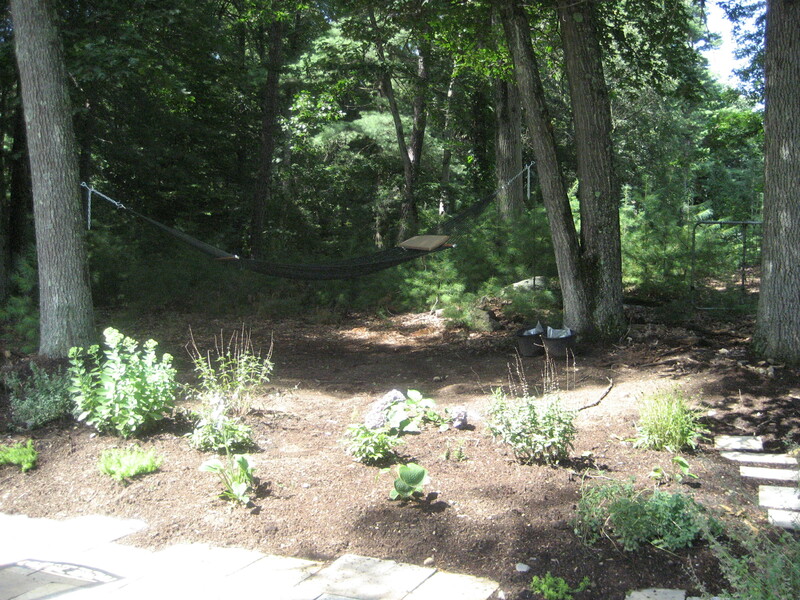 I would sit in my hammock with a book, but after about 30 seconds I would be staring at my garden, thinking about my next move or project. It was such a therapy for me. 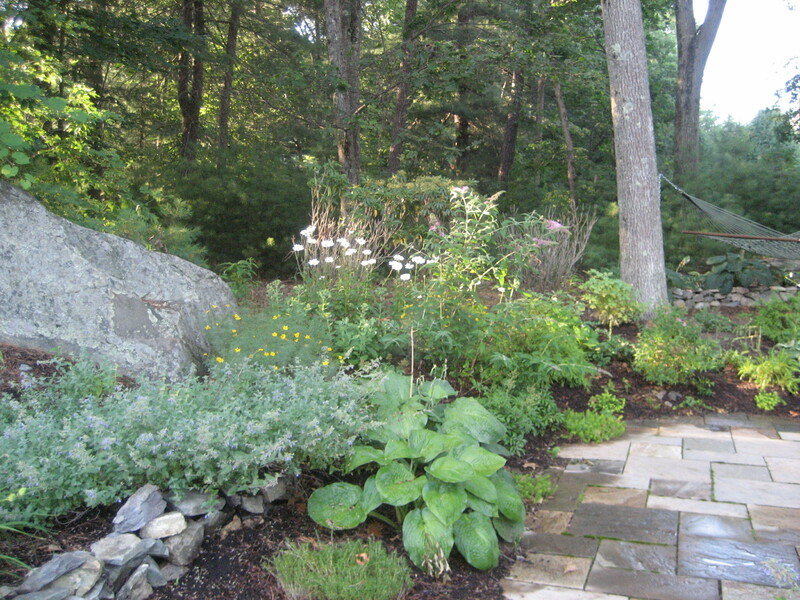 I can’t wait to see how much the garden has grown this year when I go back to Boston to visit my parents. So this year I’ll be gardening on a very different scale. 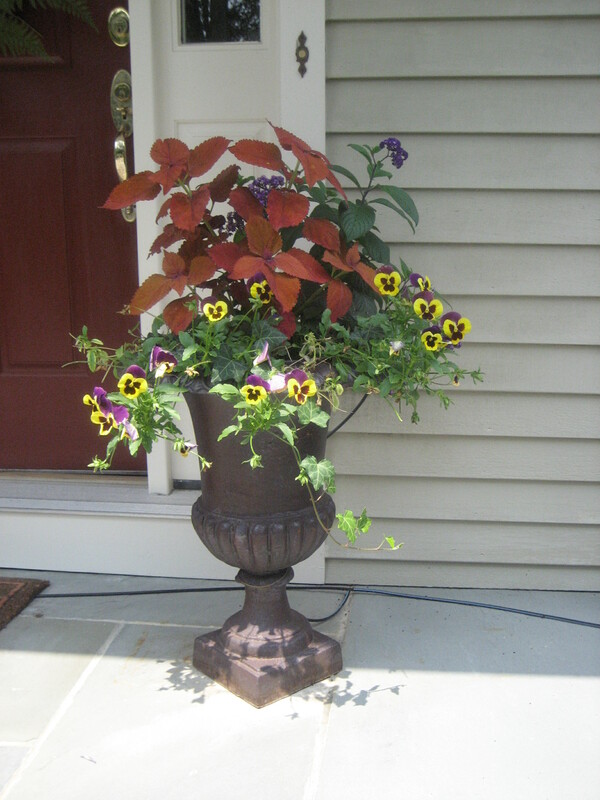 I will be confined to container gardening for my flowers, but I am determined to make the most of it. 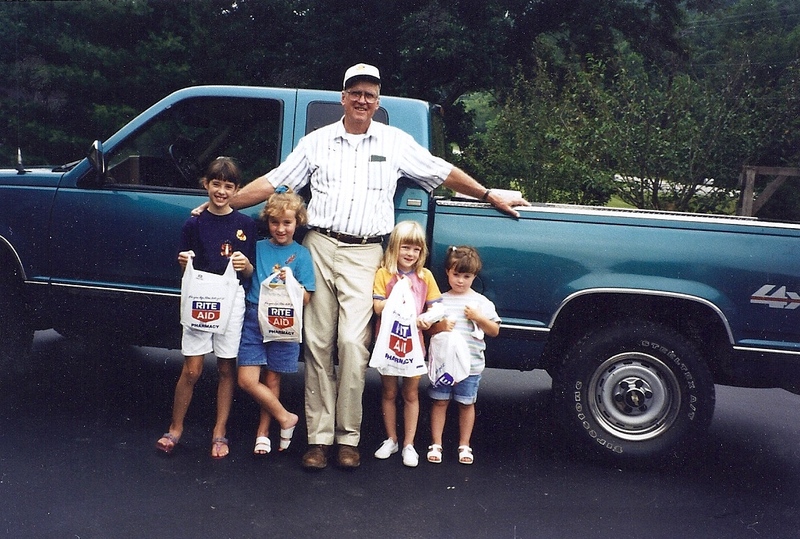 Thankfully, my papa has agreed to let me help with his vegetable garden so I will at least have a decent amount of square footage to play in when I visit my grandparents in Kentucky. 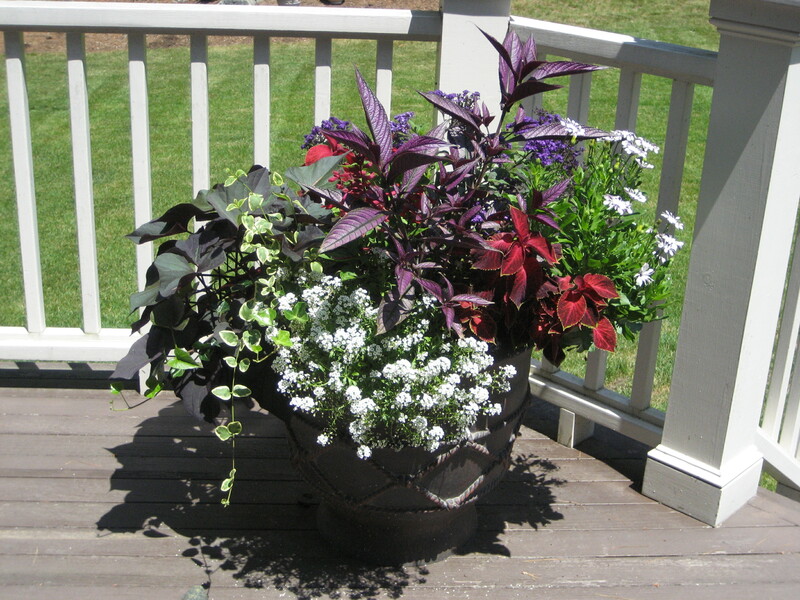 More to come on the container gardening on my 50 square foot deck. 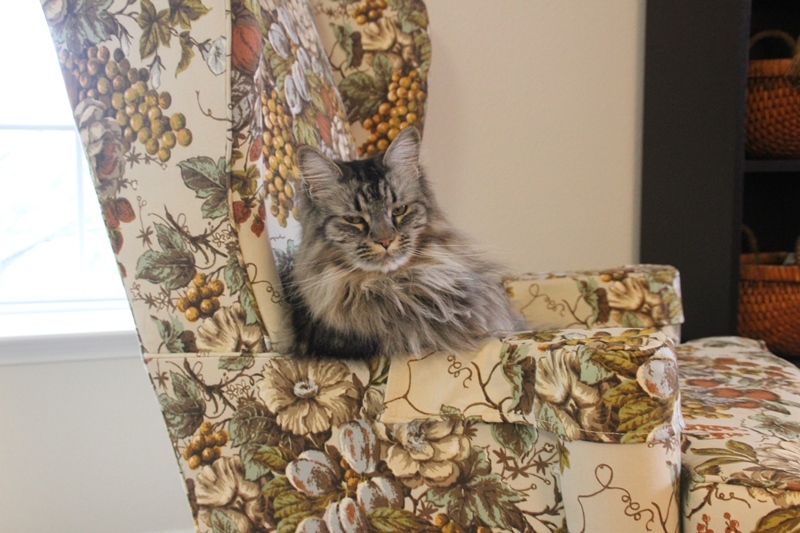 This was my cats Scarlett’s chair at my parents’ house. 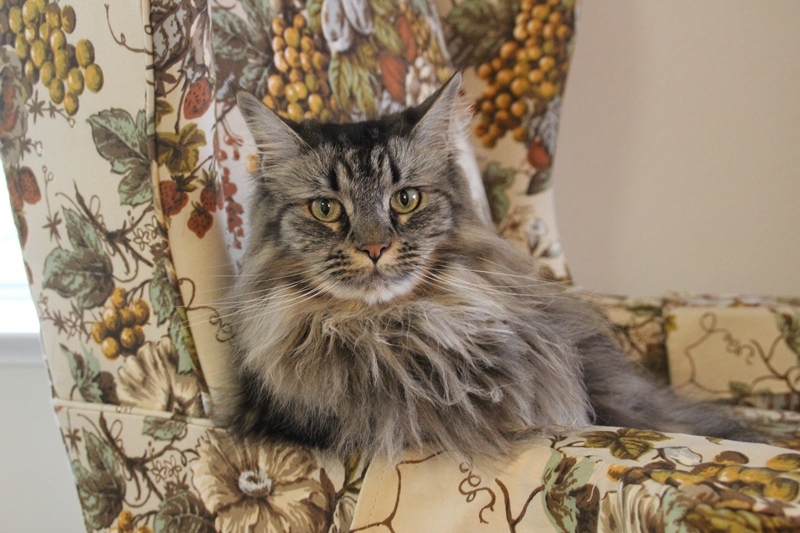 She has good taste in chairs as it was the most comfortable chair in the house, but unfortunately it did not face the TEE-v so people rarely sat in it. That was just fine with Scarlett. 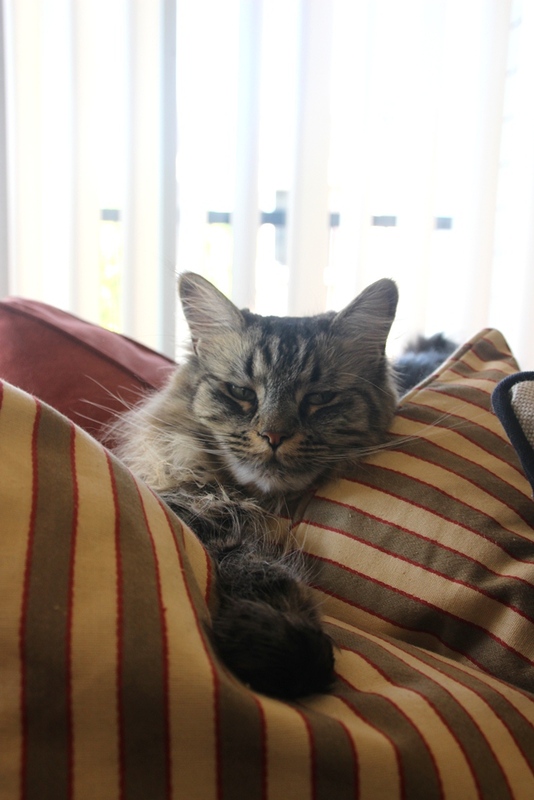 She’s so cute when she’s sleeping. 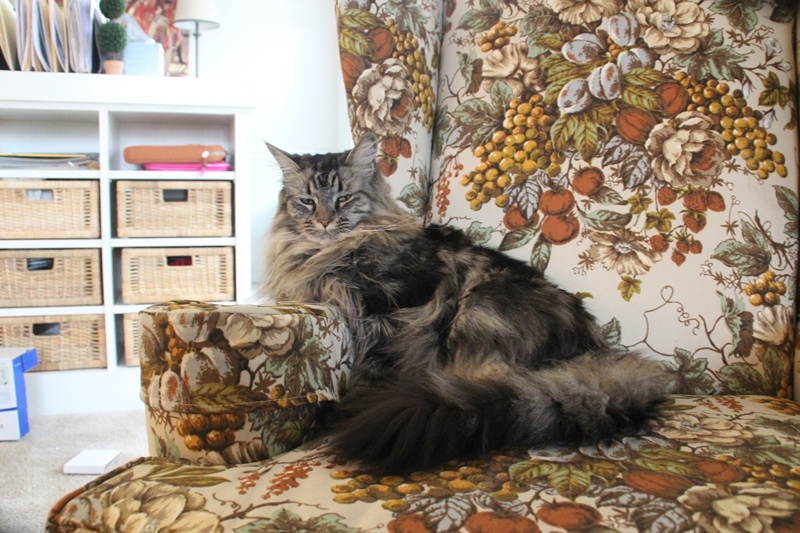 She loved to sit up on the back cushion of this chair, which was very wide and soft. 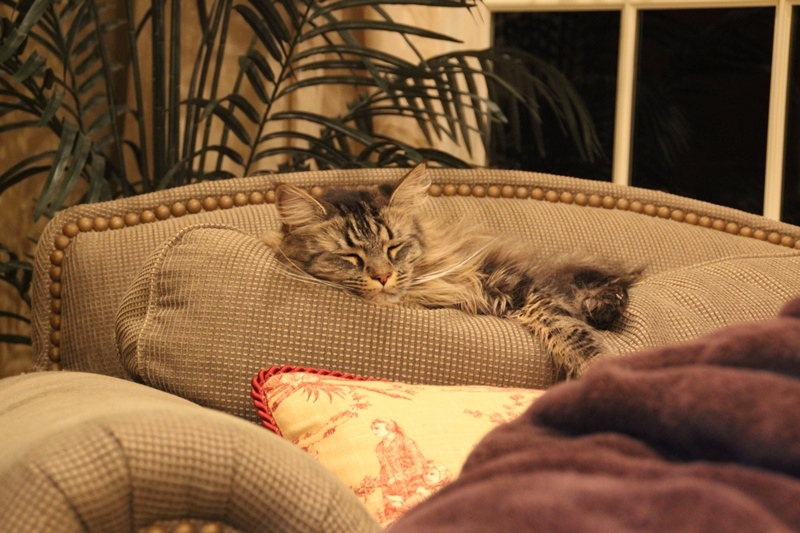 It had a permanent slouch in the middle of the cushion from her sitting there so often. 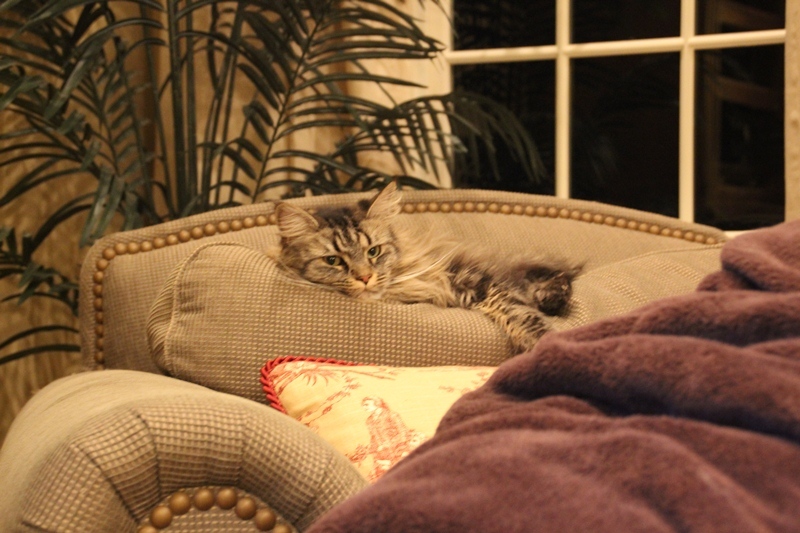 I imagine she liked sitting there not only because it was comfortable, but also because she could observe all of us sitting in the family room and see through the door opening into the kitchen to keep tabs on the activity in there as well. 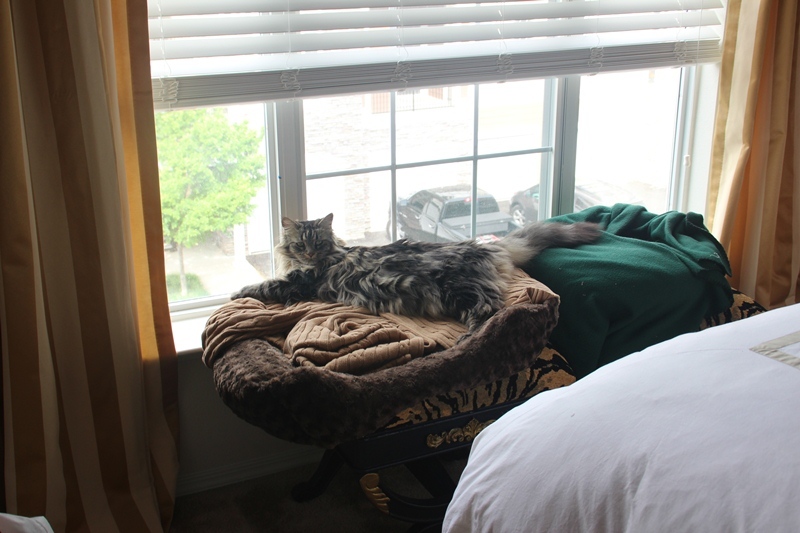 This is very important to her as she insists that her contribution to the household is to secure the premises. She’s not just a pretty face, ya know. 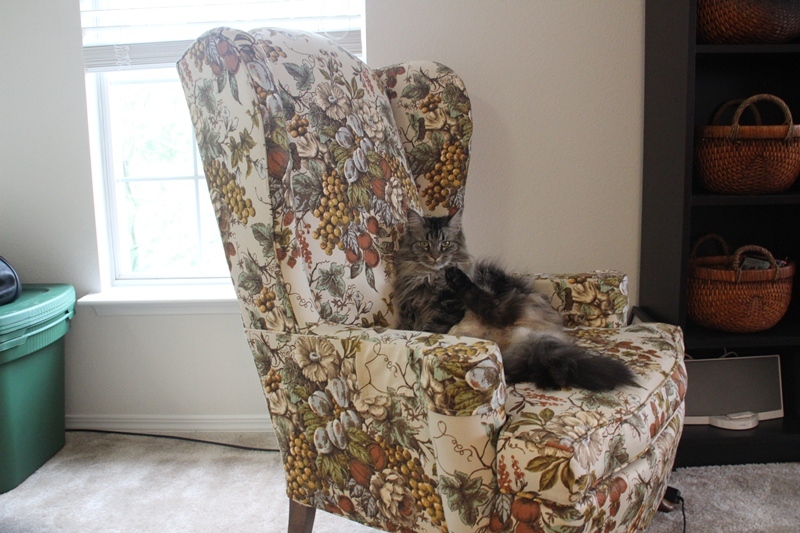 Because this was her favorite spot, I was a little bit nervous about how she would handle the move given that I was not taking her chair. 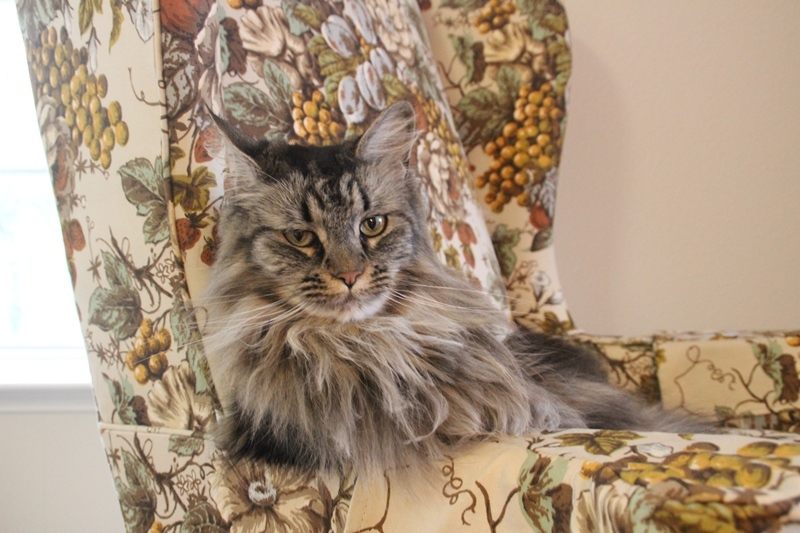 It did cross my mind to take the chair but a) it’s not mine to take as it is part of the seating arrangement in my parents’ family room, b) it’s an enormous chair and would be way over-scaled for my 980 square foot apartment, and c) it would be absurd to bring a large chair for a cat. 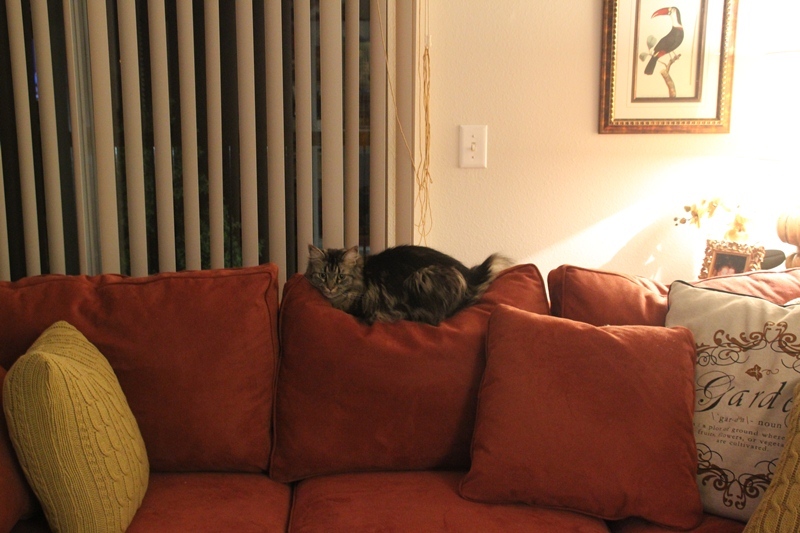 So as we settled into our new apartment, I waited to see where Scarlett would perch. 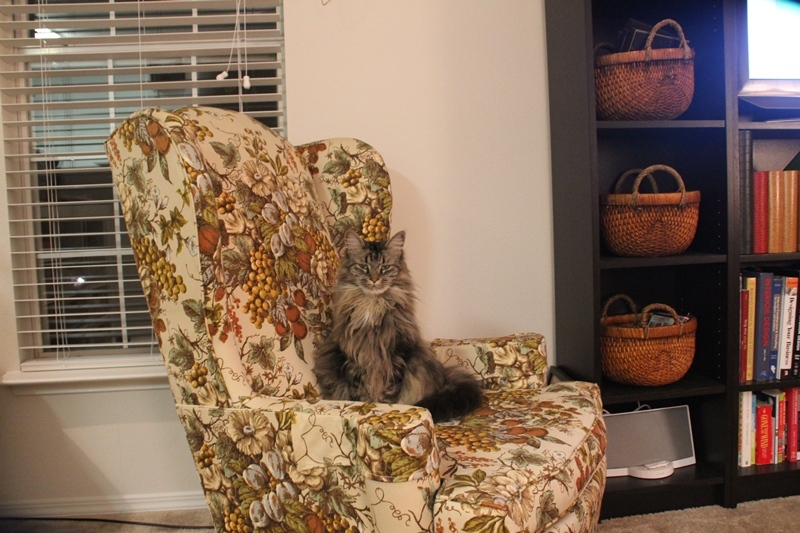 She quickly adopted one of my Aunt Anna’s chairs that I have in my apartment. 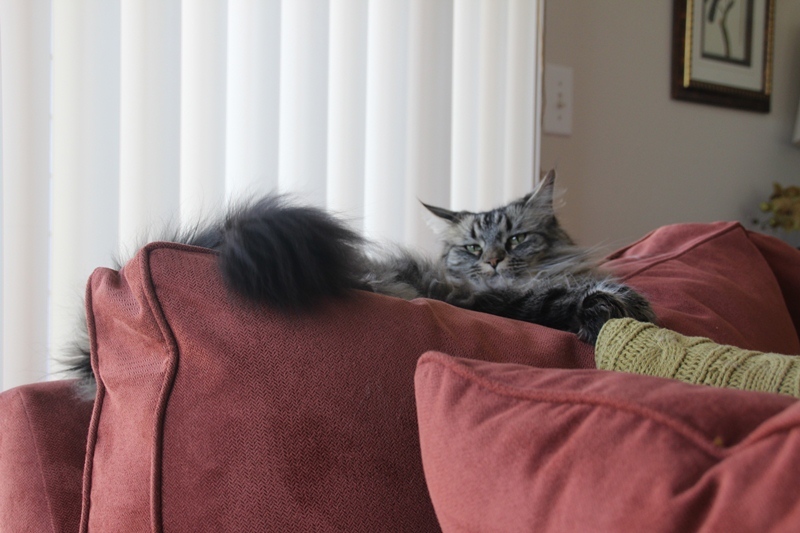 I am sure it is no coincidence that she chose the one where she can stare me down as I watch TV from the sofa as she simultaneously watches birds flitting around on my deck through the glass door. 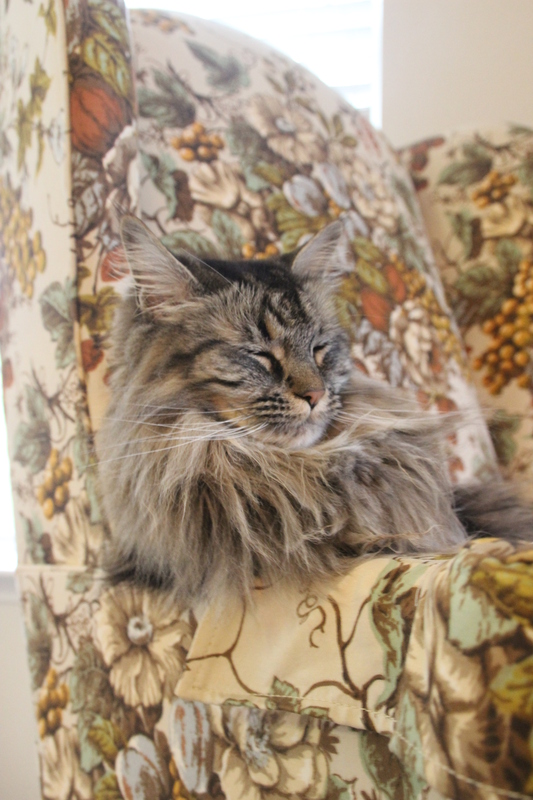 She has really taken to this chair. 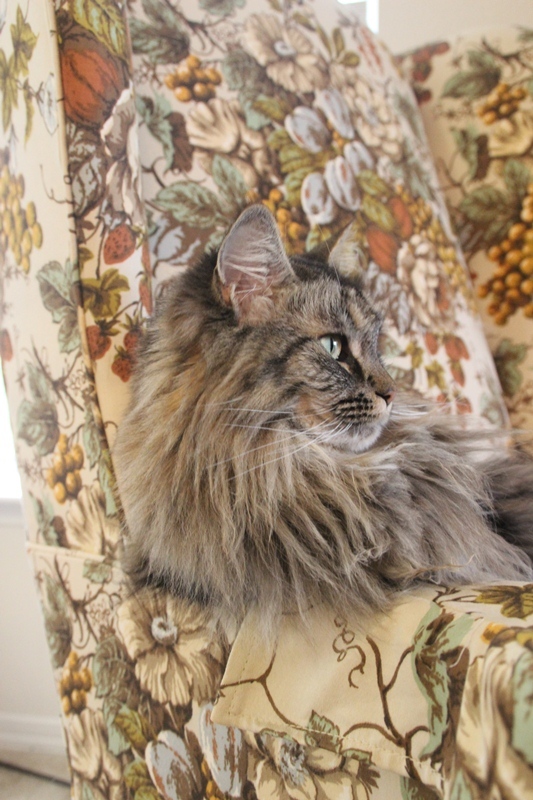 As it is a tight-back chair, it isn’t comfortable to sit on the top of the chair (I would imagine), so she just kicks back on the seat cushion like a raccoon. Sometimes she falls asleep on the job. She’s really leaning into that armrest. Good thing it’s just her height. 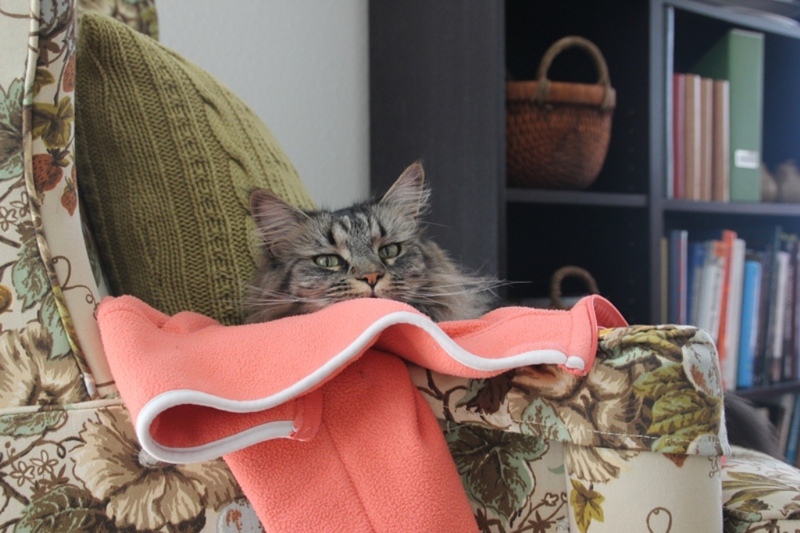 While the chair is her usual hangout, she sometimes opts for the higher altitude of the back cushions on the sectional so she can see me if I’m at my desk or in the kitchen. 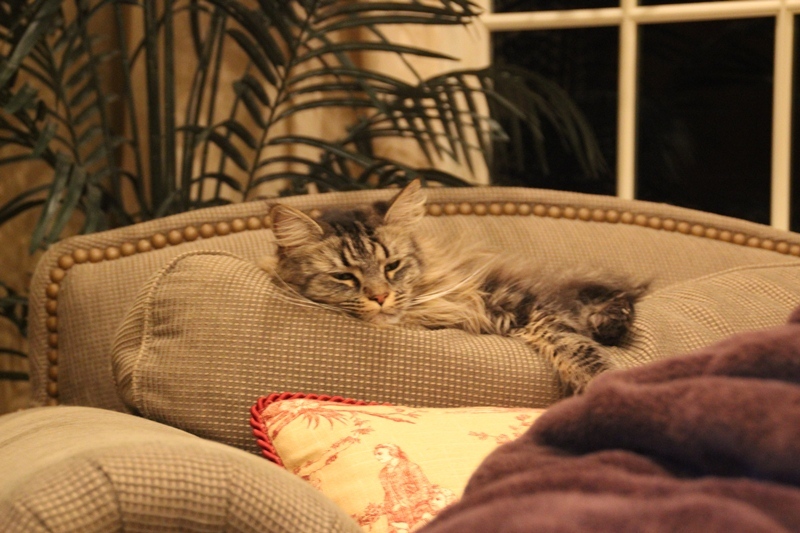 These are not nearly as soft as the cushion on the chair she loved so dearly at my parents’ house so she is making her way around the sectional, breaking in each of the pillows for me. What would I do without her? 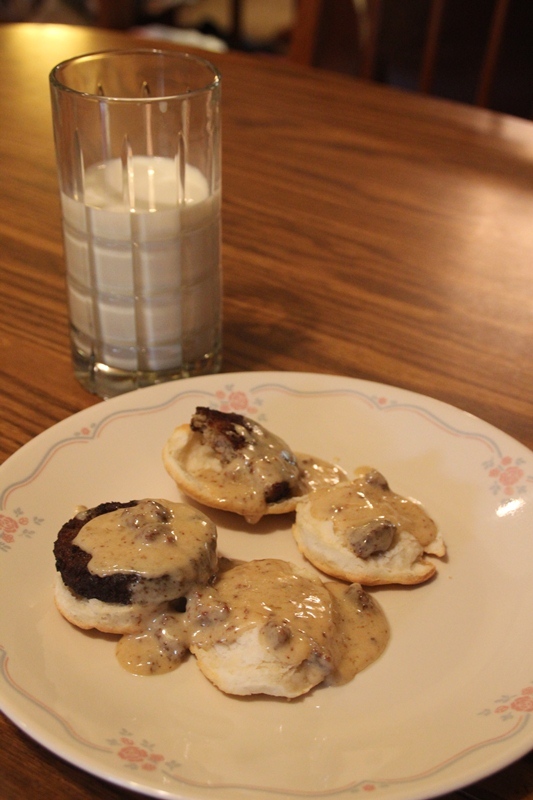 One of my favorite breakfast items is biscuits and sausage gravy. And sausage, of course. 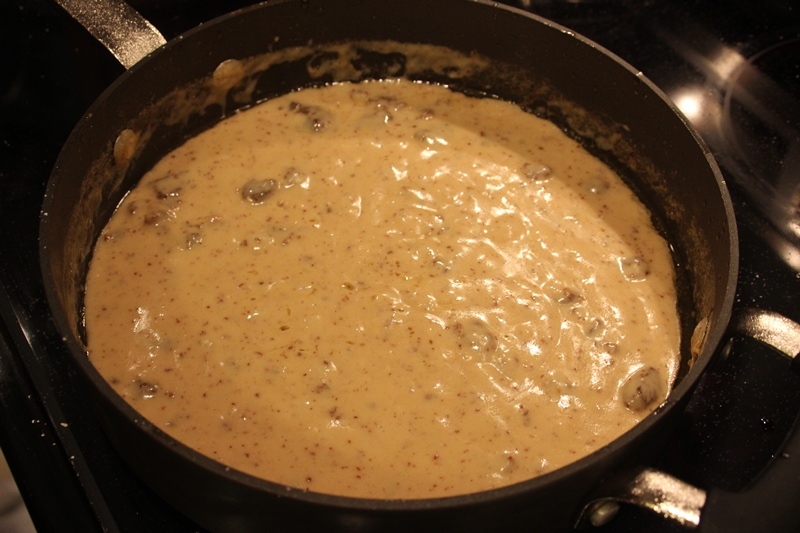 My granny makes a mean sausage gravy and I look forward to it when I visit. Although I tried to make this breakfast for myself once (unsuccessfully because I couldn’t find the right sausage in the Northeast), I think I am going to limit myself to eating this only when I visit my grandparents for the sake of my hips and arteries. It’s very important that you make this an irregular part of your life. Yes, that’s right. IR-regular. I say this out of concern for your health. But, nonetheless, it should be a part of your life even if it’s once every month/week/day or two. 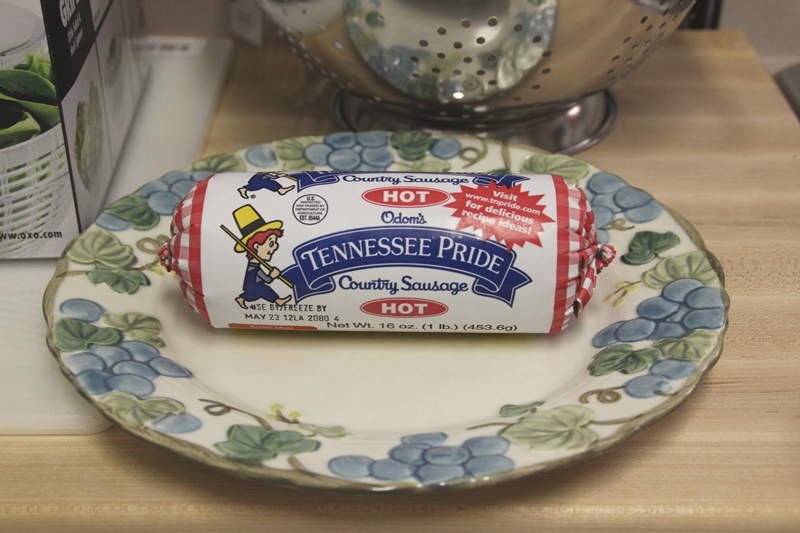 It is CRITICAL that you begin with good ol’ country sausage. 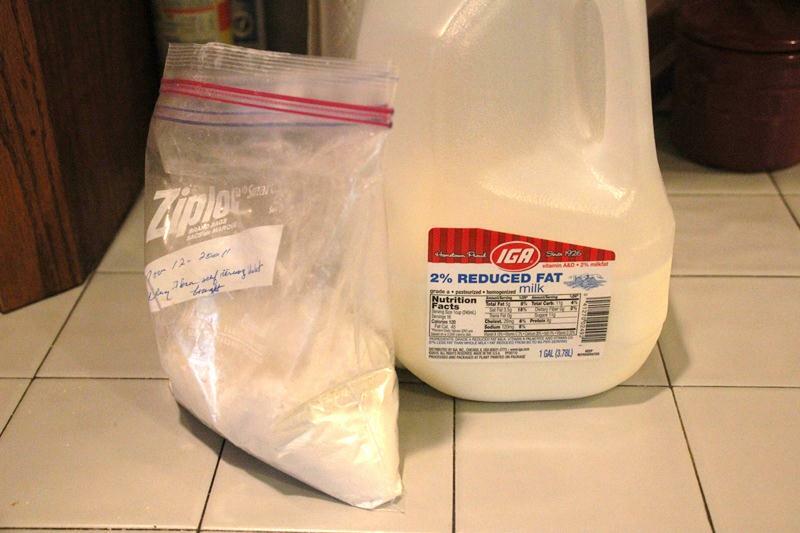 By this I mean loosely packed and with a good amount of fat. I would recommend Tennessee Pride, Ole South or Old Folks brands. 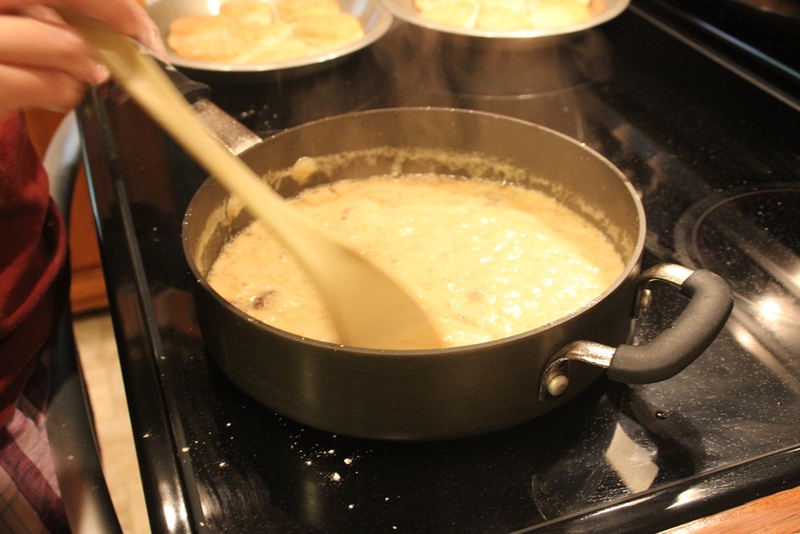 I would not recommend Jimmy Dean because it is too dense and lean and thus will not render enough fat for the gravy. 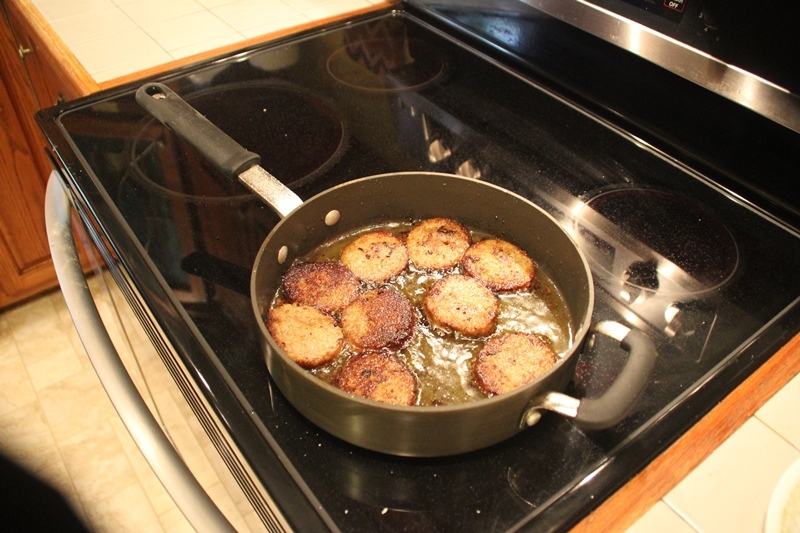 So, once you have proper country sausage (hot or mild, but hot if you are really serious about this), cut it into ½” patties and set ‘er in the skillet. If you are intending to have 8 sausage patties to serve, cook 9. I will explain this later. My cousin Lauren was frying up the sausage this particular morning. Cook them over medium-high heat until the meat is cooked through and the patties are nice and browned. 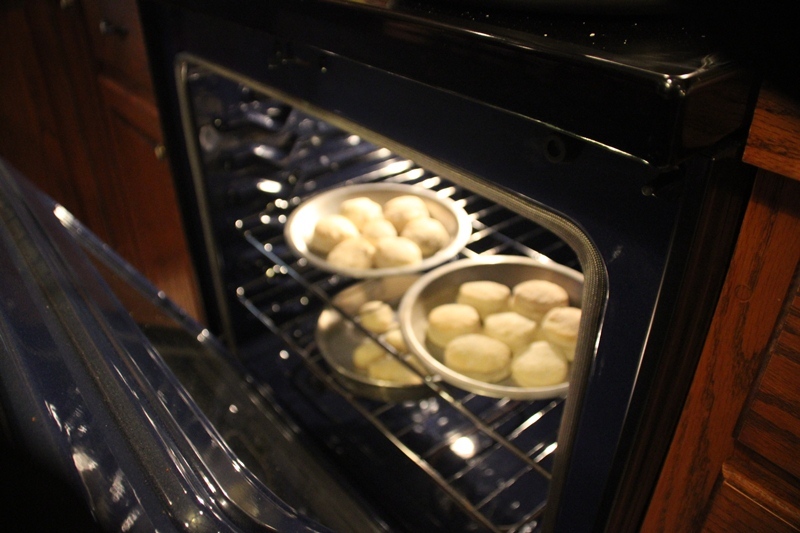 Meanwhile, have some homemade biscuits baking in the oven. I was not present for the making of these biscuits, but I understand that there was lard involved. That’s all I care to comment on the matter. When the sausage is done, place the patties on a plate lined with several paper towels to absorb the excess grease. 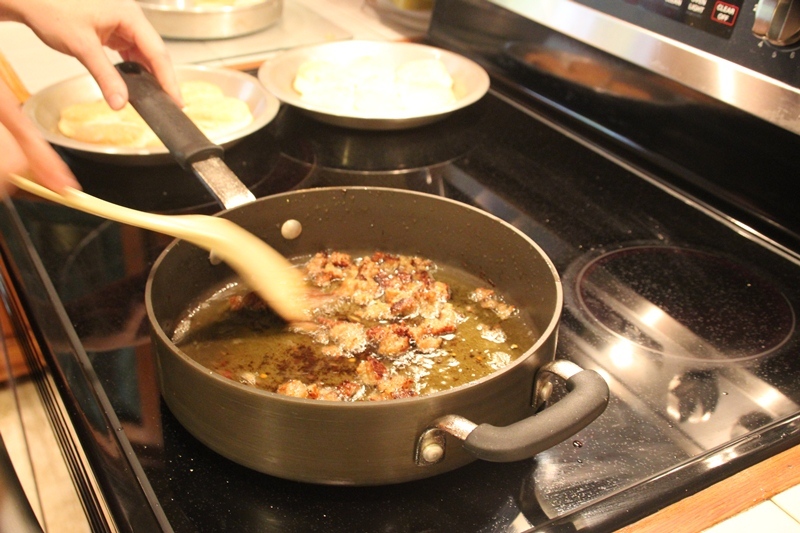 If there is too much grease left in the skillet, drain it off. I can’t give you an exact amount because I don’t know how much sausage you are cooking, but I would say for 8 sausage patties, you don’t want more than ¼ cup of grease to make your gravy. Now, this is a VERY IMPORTANT step. 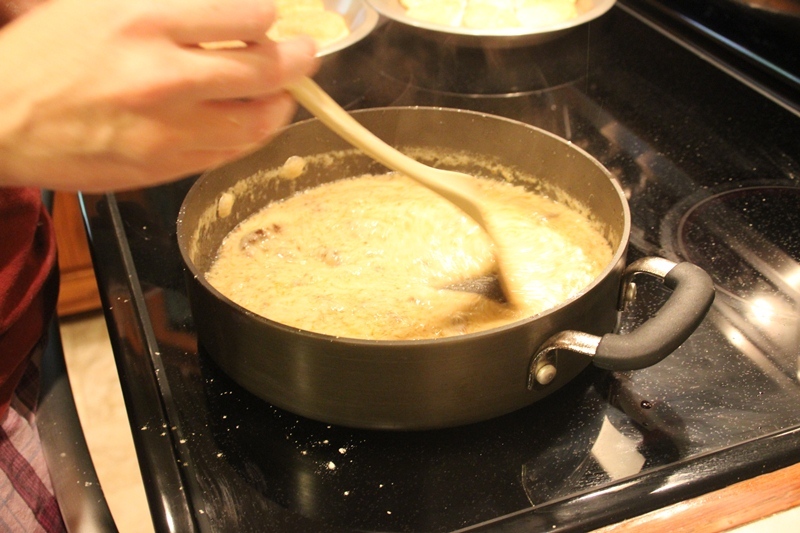 Break up the extra sausage patty into small crumbled pieces to add texture to the gravy. You did make an extra didn’t you? Next, with the desired amount of grease and the extra crumbled patty in your skillet, grab some milk and some flour (pronounced “flair” if you have a Southern accent). 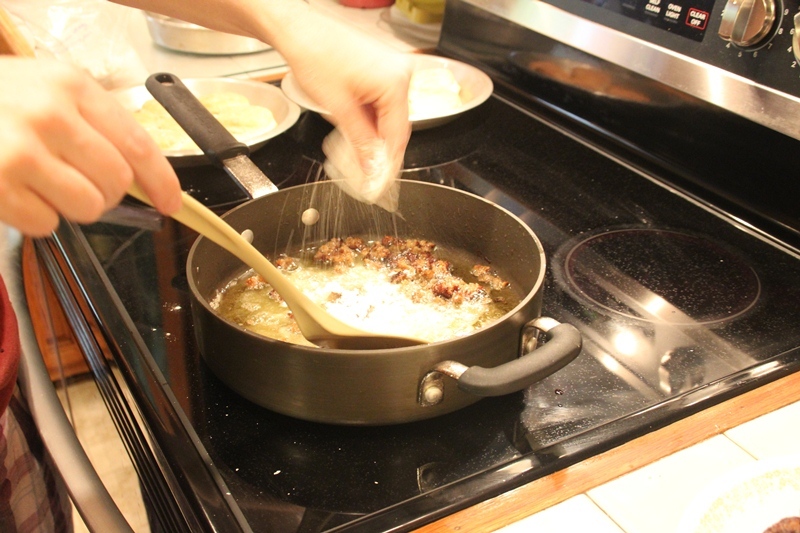 Sprinkle in approximately the same amount of flour as there is grease in your pan and stir. Let’s say ¼ cup since we are working with a ¼ cup of grease. You may want to use a whisk so it doesn’t “lump up on you,” as my granny says. Let this cook for a few minutes until the mixture is a nice golden brown. That’s what my mammie (and it seems all Southern cooks) say because they don’t really go by measurements, they go by look and feel. Then let it cook for about 5 minutes or until it has thickened, all the while stirring and scraping the skillet so it doesn’t burn. You will know it has reached this stage when you can see the bottom of the skillet in the wake of your spoon/spatula. The gravy should have a nice brown color to it. Season it with a little salt as needed. And pepper if for some strange reason you did not go for hot sausage. Stunning. Look at all of those brown bits. MMMMMMMMM. 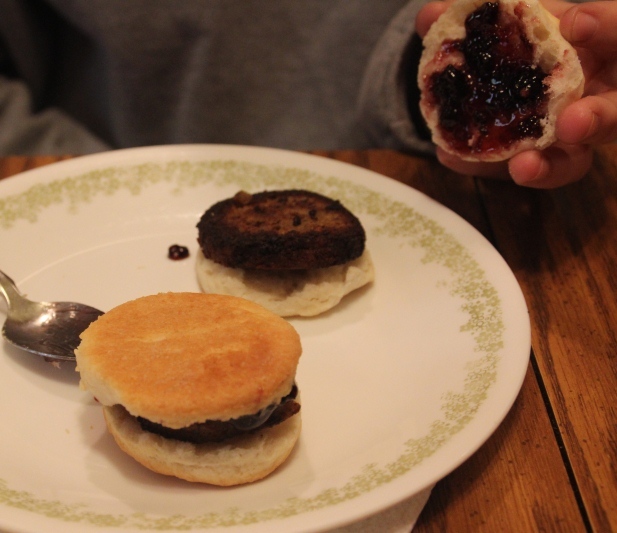 My cousin Kristen had clearly lost her marbles and opted for blackberry jam with her sausage n’ biscuit instead of sausage gravy. I’m all for sweet and savory but I just don’t know if I can get on board with this one. 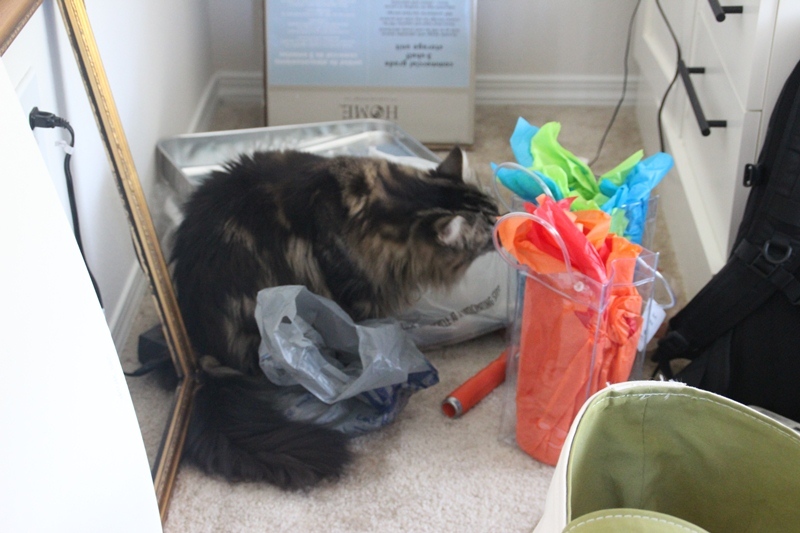 When I moved into my apartment, I was able to find a place for most things fairly quickly. 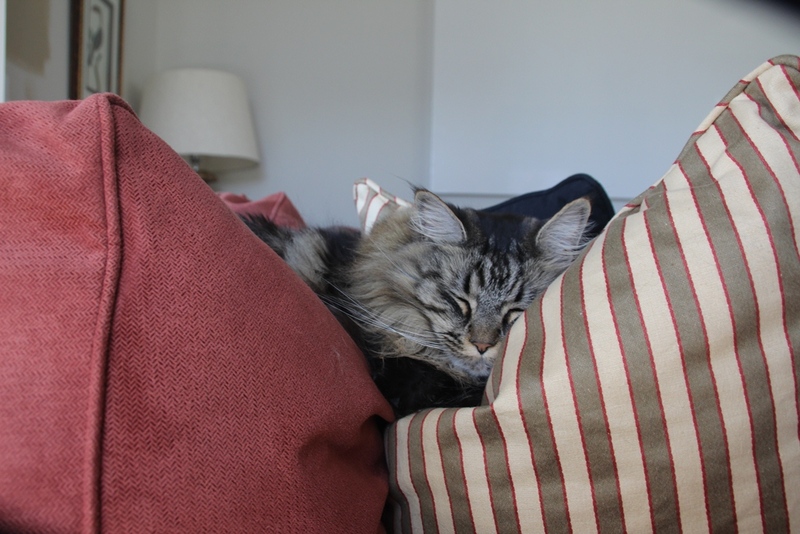 Books go on the bookshelves, dishes go in the kitchen cabinets, sofa goes in the living room, cats go wherever they please, etc. My clothes, however, were a different story. 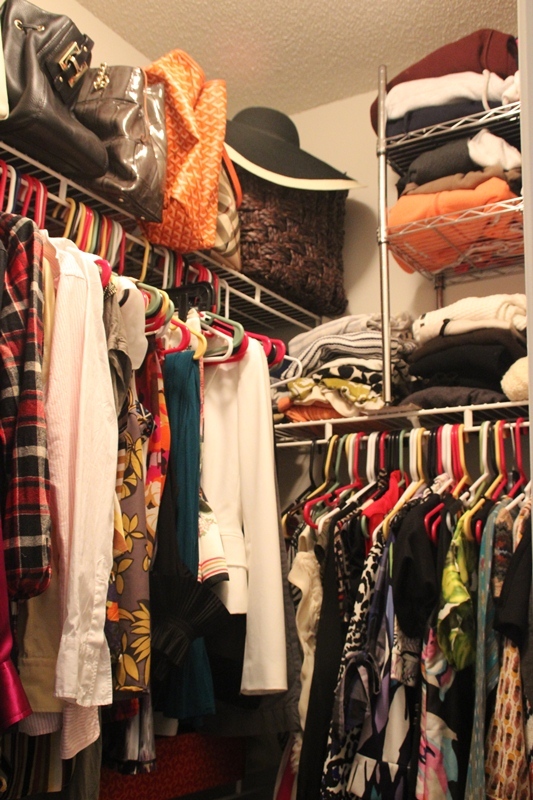 I am fortunate that my small apartment has a good size bedroom closet. The only problem is that it is set up for hanging space only. 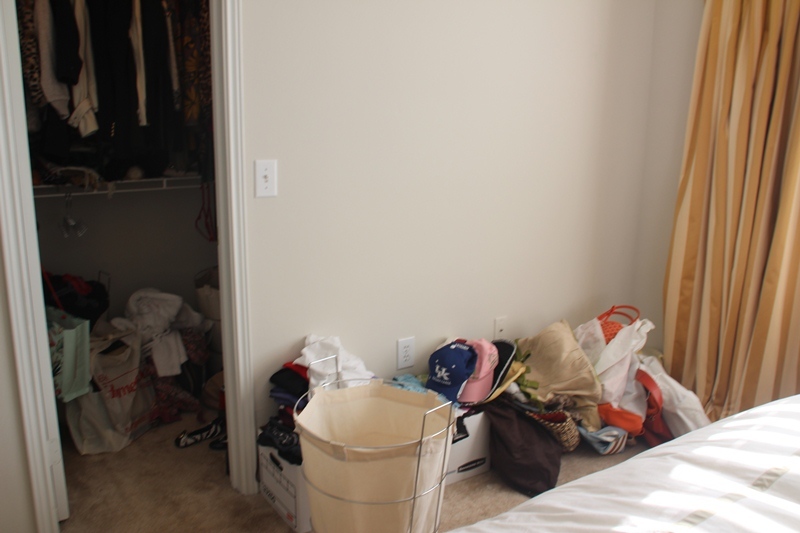 I’m sure the apartment was designed with the expectation that the tenant would bring a dresser or armoire, which most normal people have, but I do not yet own one. Eventually, I hope to buy a really neat, antique armoire with shelf and drawer space, but that will take lots of searching and deliberating and may not happen for many months/years. 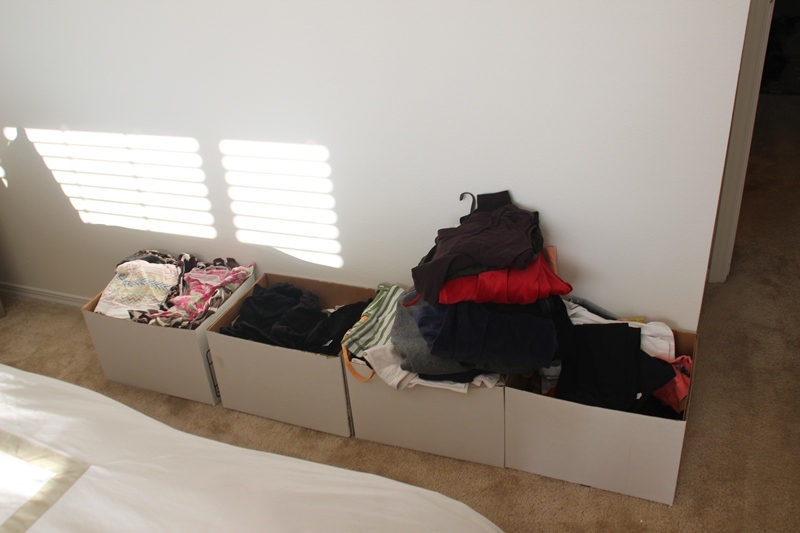 While I pondered this dilemma, my folded clothes, bags and shoes sat in boxes and even larger bags on my bedroom floor for about a week, which I found to be thoroughly irritating. 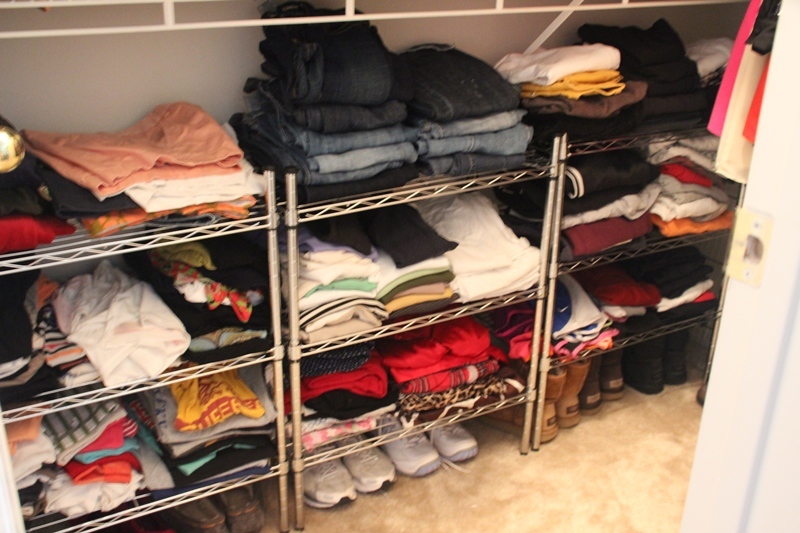 I like to be organized and for everything to be in its place so this was a bit challenging for me. I had to dig through boxes and piles of clothes to find an outfit for a meeting or Church or just any outfit that didn’t look ridiculous in public. It probably would have been easier to find things if I had labeled the boxes…but that would have made the box situation far too manageable. I perused the isles at Lowes, Home Depot and Bed Bath and Beyond, waiting for just the closet solution to jump out at me. I didn’t want to spend a ton of money on some fancy system, but I also didn’t want something that was going to fall apart. A few days into my search, I found some simple, metal racks with 3 adjustable shelves. 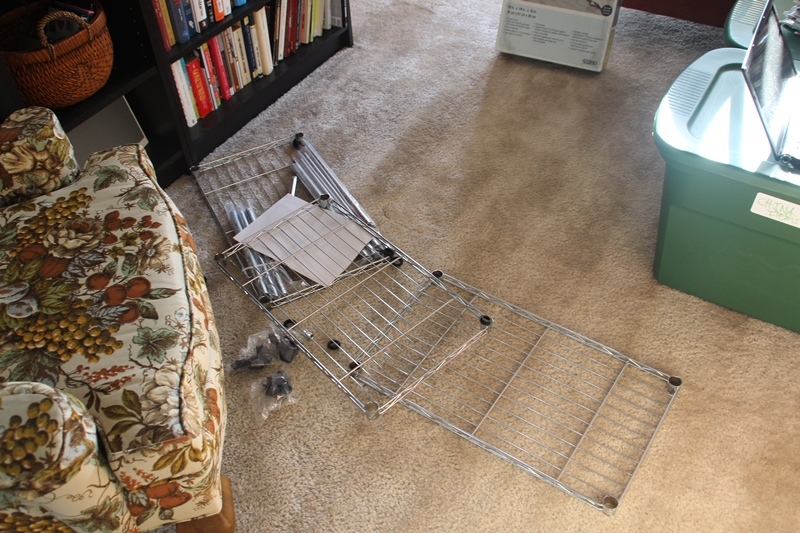 The directions specified that this was a 2 person assembly job due to the dangerousness of the metal objects. Somehow, I survived the assembly of 4 shelving units. I have fairly high ceilings so I actually put one of the shelving units on a high shelf for my “winter-ish” items that I don’t need to wear at this time since we are averaging 75 degrees in Nashville. 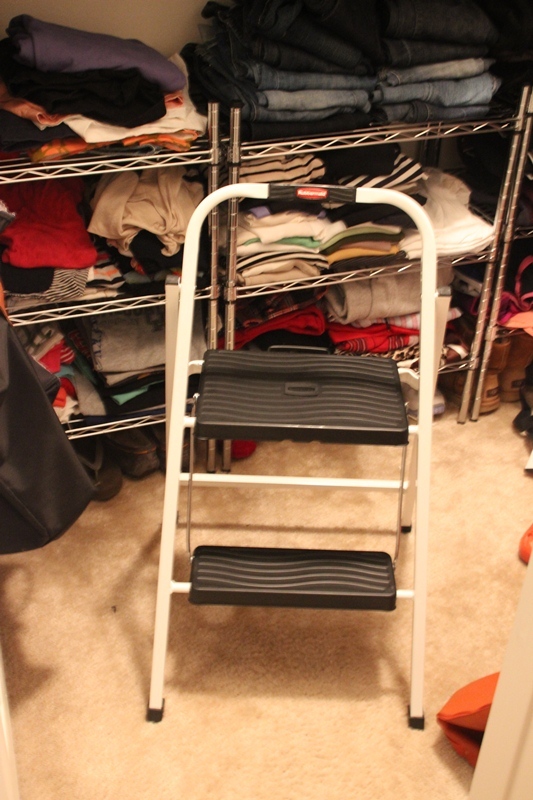 After testing the limits of the upholstered stools in my room by jumping on them in order to sling purses onto the top shelf, I decided it was probably a good idea to invest in a proper step-ladder to prevent any injuries to me or my upholstered stools. Look at all of that glorious shelf space. Clearly, I could use an internship at J. Crew where everything is folded perfectly, but I was just so happy to have shelf space that it appears I let it get the best of my folding skills. One thing that irks me is that the shelves in the unit on the far right do not line up with the shelves in the other two units. This is not a mistake; I had to make them higher so my Uggs would fit underneath, but nonetheless it bothers me. Maybe I should adjust the other two so they are higher? Sadly, all of my shoes did not make it into the closet due to a lack of space. Luckily, I brought along my trusty door-hanging shoe organizer from college that has 30 shoe slots. I have been known to pack 50 pairs of shoes into this thing so I’m very glad to have it. The alternative was to line up my shoes around the perimeter of my room, which would have kept me up at night. 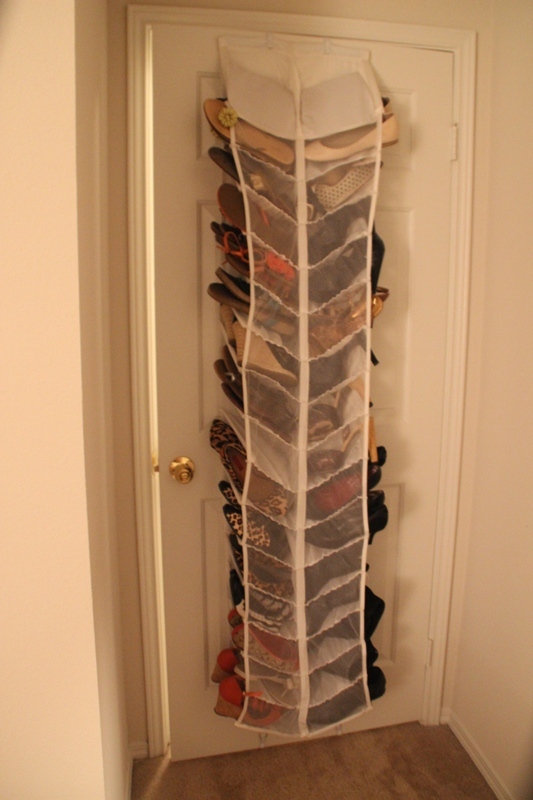 While it would have been ideal to hang this on the back of my closet door, there is not enough depth between the door and the wall to accommodate the shoe rack. Thus, the shoe rack is hanging on the back of my bedroom door. Not perfect, but at least my shoes are off the floor and can be hidden from sight when my door is open. 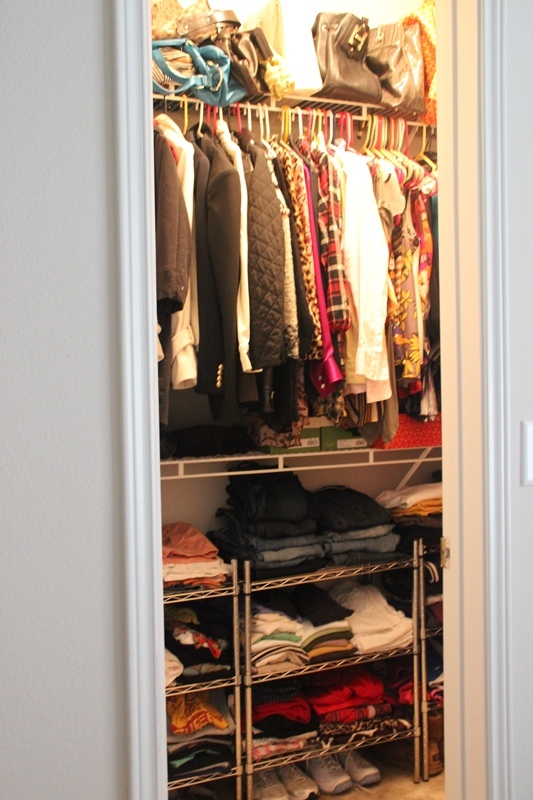 I am hoping that when I finally find the perfect armoire I can put a lot of my folded items in it and then use the metal racks in the closet for my shoes. 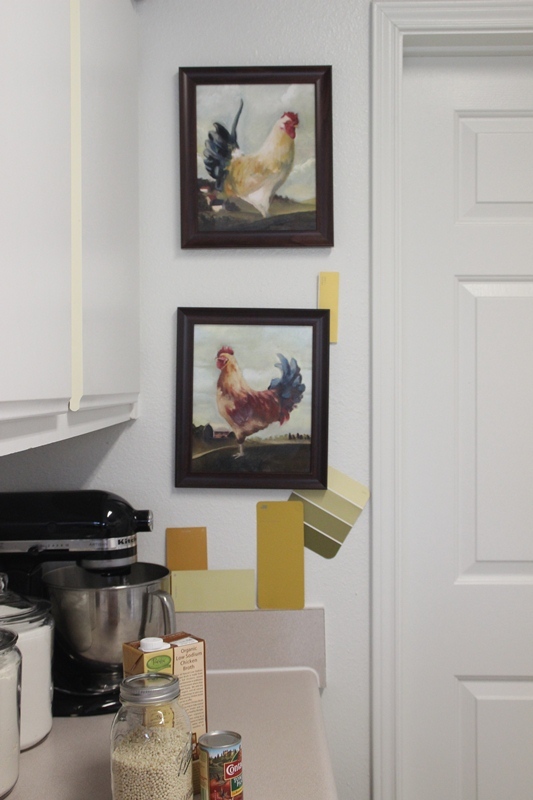 I can’t wait to find that armoire so I can worry about more important things like what color I’m going to paint my kitchen.